Trunki have collaborated with the makers of the world famous Gruffalo to make an all new and exciting Trunki! This growling Trunki includes all the Gruffalo's recognisable features and even includes a sticker pack for kids to personalise it. 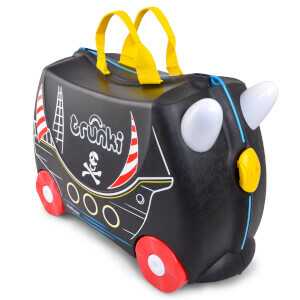 Designed for use as hand luggage, children can pack all their favourite toys inside the cute Trunki, then enjoy whizzing around the terminal. Parents can keep kids in tow with the included carry-tow strap that clips to the front of the suitcase. My son was so pleased about his new luggage!